After being a professional blues and rock player for six years, I was living the blues. My health forced me to retire from the live circuit after my band had taken on venues like Boston Rock Lounge, Crossroads and Sinkshack. I didn’t want to stop playing, and my family couldn’t afford to lose the income. So I switched to teaching. I hadn’t formally taught before, but I’d shown people some chords after a show. During peak times, especially vacations, I was giving six to eight hour-long lessons per week — excluding the occasional twice-weekly extra lessons. Want to do the same? Here’s how to make money giving guitar lessons. I started giving hour-long lessons twice a week at $25 per lesson. Within two months of signing up my first student, I had three more. I made $400 per month for the first couple of months! Some students returned for extra weekend lessons when they had gigs coming up or needed more help. You don’t need thousand-dollar equipment to teach; it’s not about what you play. 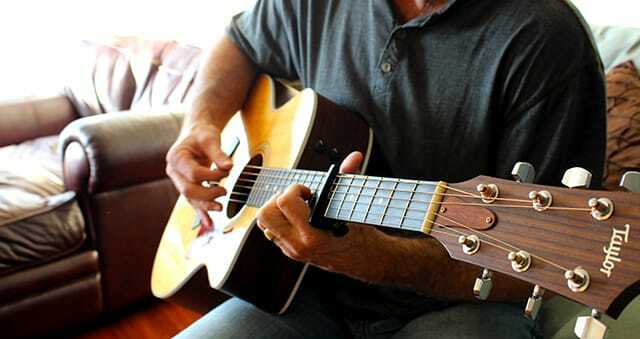 An acoustic or electric guitar with a small amp are more than enough to start giving lessons. If you don’t have gear, borrow some. Or do what I did: Ask the student if you can use theirs and pass it around. If you’re like me and haven’t taught before, visit sites like YouTube and JustinGuitar.net. Study some lessons and take note of how and what they teach. Offer a free lesson to a friend as practice. Ask them what they thought afterward — you don’t want to disappoint a paying student. It also helps to provide students with resources. You’ll need folders to file students’ progress, lesson plans for home practice, and pens and notebooks for their own notes. Guitar and musical theory books, digital song files, guitar picks, extra strings and a tuner also are a great help. Before sitting down for the first lesson, protect yourself and your students with a contract. This sample will get you started. Which level can you teach at? Consider both your experience and theirs. Beginners can be kids who just got their first guitar, old-timers who want to play again or people who just want to learn one song. Intermediate players have learned the fundamentals and want to go over them again, or have been playing for a while and want to pick up new tricks. Advanced players usually want to improve their skills, learn new ones or sharpen up their musical theory. Be prepared for them to level up. For beginners, I kept lessons at hour-long sessions twice a week, but lessons for intermediate and advanced students could run over two hours. Remember to include short, five-minute breaks during your lessons — even rock stars need a break! Also, decide which niche or genre you cater to — metal, blues, classic rock or country. Sometimes students want to learn specifics. They’ll want to learn how to play a certain song or improve their solos. Students might also need help and advice picking out gear. To get people to know you, advertising is key — so start early. Eventually I got business from word-of-mouth, but I started out advertising everywhere. I got my first three students from several online ads, and they started referring their friends. Place flyers in music stores, post online ads, print business cards and build a solid web presence. Get on guitar forums, start a Facebook page and a website. Upload a free lesson to YouTube or guest post for a guitar blog so people can see what you do. All my advertising was virtually free. I used my existing blog, YouTube, forums and online classifieds. Decide if you’ll teach in person, via Skype or both. Each option allows you to spend time with your students, just in different ways. Skype removes the need for travel, opening up a world of new clients. In addition, Skype lessons let you plug a guitar and microphone directly into your computer for online “conference jams” with students. You might also need to buy a quality webcam, microphone and a USB-to-guitar interface if you want to teach via Skype. I always treat the first lesson as an introduction. Each student is different, so get to know them and their ability. Students want to learn, not be overwhelmed. Tailor lessons for each student and plan ahead so you’re able to provide a progress report and they can see how they’re doing. For my first lesson, I showed the student (an 11-year-old boy) basic chords (D, A and G) and made him connect them together to form Creedence Clearwater Revival’s Bad Moon Rising. When I saw him a week later, he had learned the song — and come up with his own! His parents were impressed enough to book and pay for six more lessons. How Much Money Can You Make Teaching Guitar? When pricing lessons, consider the various costs. You’ll have costs for travel (distance and gas, if you’re the one traveling), gear (setting up, restringing and maintaining your guitar equipment), resources (notebooks, folders, tuners, microphones, webcams and strings) and time (lesson length, preparation and travel time). Look at what other teachers are doing: What makes it work? Having more experience also lets you charge more. As a guitar teacher, you can write your own tests and get accredited with the Associated Board of the Royal School of Music (ABRSM) or Rockschool. This allows you to send your students to take graded exams. Decide how and when you expect payment: Per lesson or per week? Remember to create invoices for your payments. Consider last-minute cancellations as you plan your budget and schedule: Cars break dow, and students (or teachers!) get the flu. Will you charge a cancellation fee, refund or reschedule? Earn more by selling students guitars or guitar-related items like cables, strings, winders, tuners, guitar books, music stands and cases. Some stores will give you discounts for bulk purchases, and nothing beats a student’s smile when you help match them up with their perfect guitar! Want to Give Mobile Guitar Lessons? I still teach with Skype when I’m not writing, and I plan to offer a group class in songwriting and blues in the future, as well as start working on an album. No more touring for me, for now, and that’s all right — I’m passing it on. Your Turn: Will you consider teaching guitar lessons? Alex J. Coyne is a South African author, freelance journalist and language practitioner. His work has appeared on various blogs and in national and international publications.